In Rogue One I can't see any Y-wings helping the X-wings and the U-wings on the surface of the planet but when I searched for information about Blue Squadron in this wiki, I found that they had Y-wings according to the Star Wars: Rogue One - The Ultimate Visual Guide. With that in mind, why don't we see any Blue Squadron Y-wings in this battle? Were they present on Scariff but simply not on camera? I don't know of an official answer, but because this is about Y-wings specifically, the idea that they're doing something nobody really wants to see as Valorum suggested above is pretty plausible. 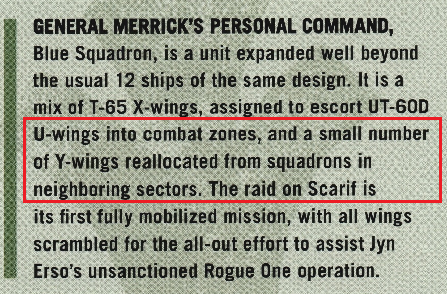 If you look at the Rogue Squadron 1998 game manual it describes the Y-wing a bit. Long story short, they do all the boring work; they're slow, heavy, clunky and they maneuver with the grace of an elephant. Their primary job is typically to dump a ton of bombs or torpedoes on something and pray they don't get blown up in the process, because they can't dodge anything. Because evidently their weapons weren't enough to break through the shield infrastructure in this fight, they would have been pretty irrelevant, at least as far as the effort to support the ground troops was concerned. Assuming all of the ships mustering above the Raddus were members of Blue Squadron, then we see at least two Y-Wings gathering in the formation. They don't seem to take any part in the subsequent battle, or at least they're not visible at any point later in the film. Presumably they're off doing something less exciting. Of the four Y-wings that are supposedly in the squadron, only one pilot is mentioned in the Visual Guide by name; Paril Ritta. This actor isn't named and he doesn't appear in the film. In the Battle of Scarif only X-wings (12) and one U-wing made it to the surface to help ground forces. No Y-wings as we can see, presumably because they were to slow to attempt this (even some X-wings didn't make it). Shield Gate was most important objective for the rest of the Rebel fleet, because with the shield up members of Rogue One could not transmit Death Star's plans even if they got them. Secondary target was small Imperial fleet above Scariff (2 SD and TIE's ) . Y-wings engaged Shield Gate, losing some in the process, but they really could not do much damage to Shield Gate . Instead, suicide attack with Lightmaker was used. Overall, most of Y-wings in the battle were from Gold squadron which was dedicated Y-wing unit. Blue squadron was mixed unit, but X-wings made majority of their fighters. I assume few Y-wings they had joined Gold squadron in their attacks, since majority of their unit was on the surface and they were separated from them. How many ships would it take to destroy a Sith or Jedi piloted ship?